The final link in the safe route from Rufford Park to Sherwood Pines is now in places thanks to Center Parcs. The Rose Cottage traffic lights have made a big difference to walkers trying to cross the A614 as the crossing point in a dip further south is very scary. Center Parcs have been very helpful by dedicating a bridleway through Broad Oak Brake. They have also removed various tree stumps and fallen trees to make the route user friendly. through Broad Oak Brake to the Rufford to Edwinstowe bridleway. 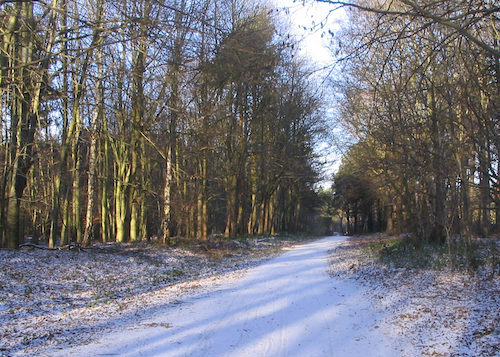 The bridleway we claimed along the side of Center Parcs, added to the definitive map in 2011. The other addition of 2015. The old King John’s Palace to Southwell Coach Road in winter. 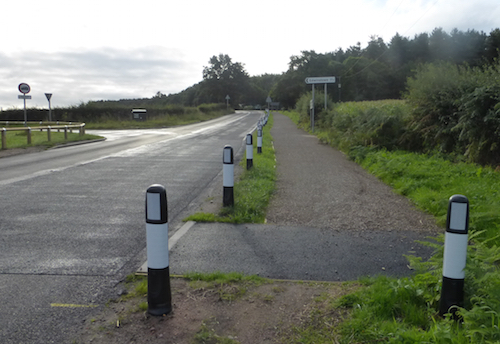 Summer 2015 saw the connectivity further improved with a short section of multiuser route connecting the entrance to Sherwood Pines to Mill Lane. This followed our traffic survey showing the heavy use by cyclists of the B6030 – in 1hr 41 mins one Sunday morning 64 cyclists and 6 walkers passed. The entrance into Sherwood Pines is on a difficult bend and the survey photos showed cars actually crossing double white lines to pass cyclists turning across the road into Sherwood Pines! Below(after) – The new section of path was mainly to improve the safety for cyclists, but it also a big improvement for walkers, especially as a large road sign that blocked the verge has been removed.